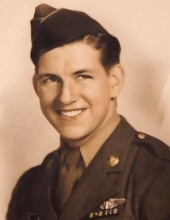 Daniel J. Sullivan, 94, of Hamden passed away peacefully in his home on March 31, 2019. He was the beloved husband of the late Anne (Hotchkiss) Sullivan. Dan was born in Ansonia on December 23, 1924, son of the late George and Margaret (Kelly) Sullivan. He attended Ansonia High School before entering the United States Army Air Corp during WWII. Dan was a quiet man, like many WWII veterans never speaking about his service which was something he said “you just did”. He flew over 40 high risk and classified missions as a part of the 8th Air Force 801st Bomb Group under the Office of Strategic Services (now the CIA). During his service he rose to the rank of Staff Sergeant before he was honorably discharged. Upon returning home he married and raised his family in Hamden where he remained until his passing. Upon his discharge, Dan began his employment with Southern New England Telephone Co. as a lineman and later as a switchman, staying with company until his retirement. He was a member of the SNET Pioneers and enjoyed attending airshows and reunions with members of the 8th Air Force around the country. Daniel is survived by his daughter Kathleen Burrill (Jordan); sons Gary Sullivan (Kristine), and Kevin Sullivan (Kathleen); grandchildren Michael Sullivan (Victoria), Margaret Lionsbeard Sullivan (Matthew Bellemare), Patrick Sullivan (Jessica), and Connor Sullivan; great-grandchildren Eva, Jameson, Calin, Theodore, and Roland Sullivan, and Jacoby Cubeta. He is also survived by many nieces and nephews. Daniel was predeceased by his daughter Margaret Sullivan; son Raymond Sullivan; brothers Raymond, George, and William Sullivan; and sisters Margaret O’Neill, Marion Sturtevant, and Louise Brown. Relatives and friends are invited to visit with Daniel’s family on Saturday, April 6th from 10:00 to 11:00AM at Beecher & Bennett Funeral Home, 2300 Whitney Ave., Hamden. A graveside service with Military Honors will follow in Hillside Cemetery, Cheshire. Memorial donations in Daniel’s memory may be made to The Salvation Army by donating online at www.salvationarmyusa.org. To send flowers or a remembrance gift to the family of Daniel J. Sullivan, please visit our Tribute Store. "Email Address" would like to share the life celebration of Daniel J. Sullivan. Click on the "link" to go to share a favorite memory or leave a condolence message for the family.